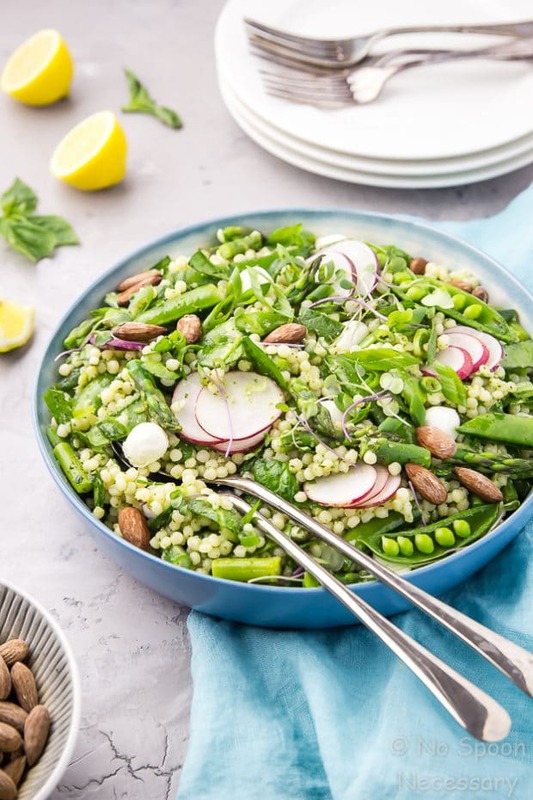 This Glowing Green Spring Couscous Salad is packed with tender-crisp vegetables, miniature balls of mozzarella and salty almonds. 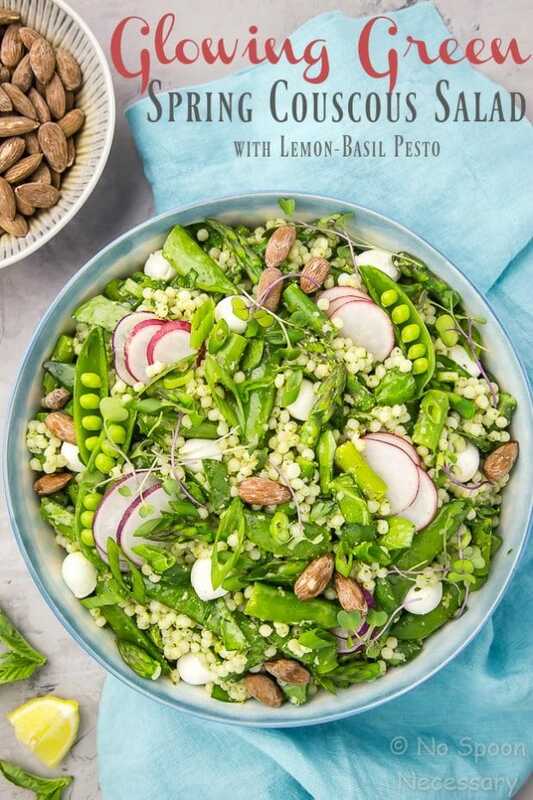 Finished with a fresh, vibrant lemon-basil pesto, this salad is easy, delicious, AND nutritious! How’s the week treating you? Is it just me, or is this week going by incredibly fast… yet, exceptionally slow, all at the same time? Like, the actual work days have been zooming by, but somehow it is ONLY Thursday. That little bugger we refer to as time is mind boggling if you ask me. Aaaanywho, I’m going to keep the rambling to a minimum today, because PASTA! And, not just any kind of pasta. 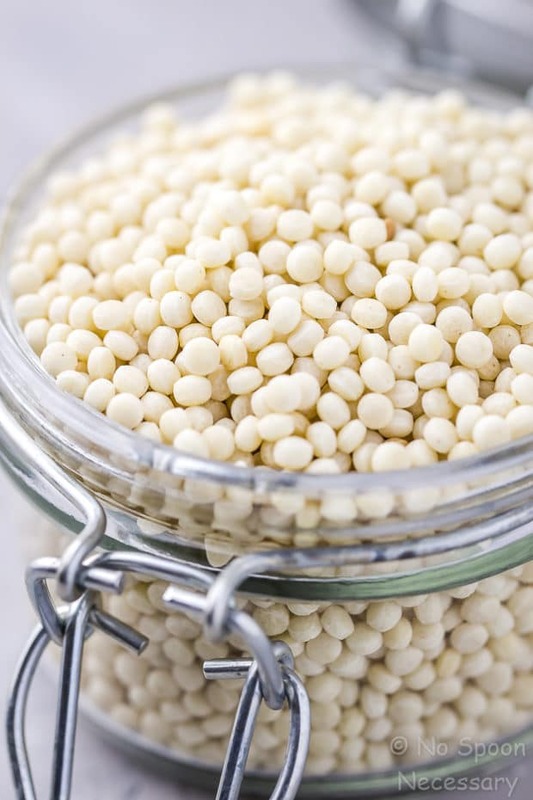 Dainty, little pearls of couscous pasta HEAVEN. 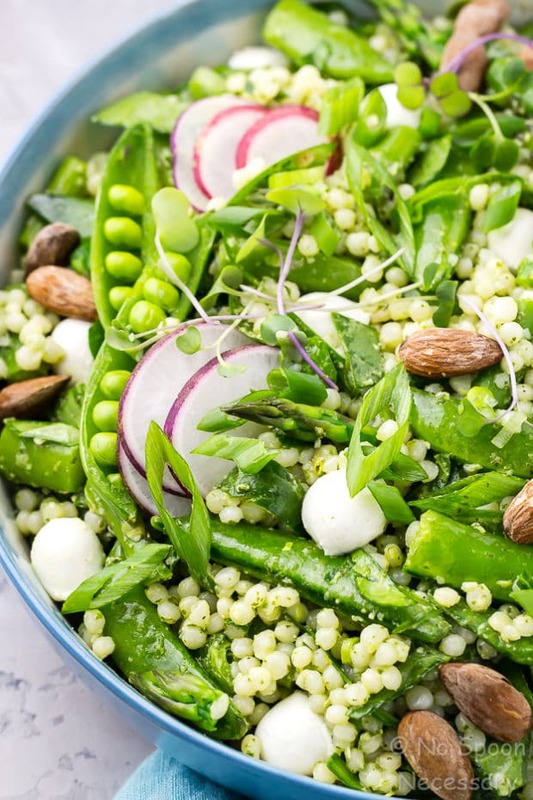 AKA couscous pasta salad that will give you a healthy spring glow like WHOA. Al dente, chewy, teeny-tiny pearls of couscous pasta tossed in silky, luscious, smooth lemon-basil pesto; studded with tender crisp asparagus and sugar snap peas; scattered with spicy, sliced radishes and chopped spinach; speckled with fresh scallions; strewn with crunchy, salty almonds and dotted with creamy, cheesy, baby balls of perline mozzarella. Healthy and refreshing (because ALL that green! ), yet cozy and comforting (because pearls of pasta), this salad is basically LIFE. Not only is this pasta salad straight up madness in the taste department, AND packed with all the healthy noms, it’s also a CINCH to throw together. First, you are going to bring a large pot of salted water to a boil. And when I say “salted” I mean, SALTED. It should be as salty as the ocean, folks. While the water is coming to a boil, fill a medium bowl with water and ice to shock the asparagus when it’s done cooking. Drop the asparagus stalks into boiling water and let them cook for a couple minutes. Then, add the asparagus tips and continue to cook until the asparagus is tender-crisp. Use a large slotted spoon and transfer the asparagus to the ice water bath to stop them from cooking further. Add the couscous to the pot, cover, reduce the heat to simmer and cook until al-dente. 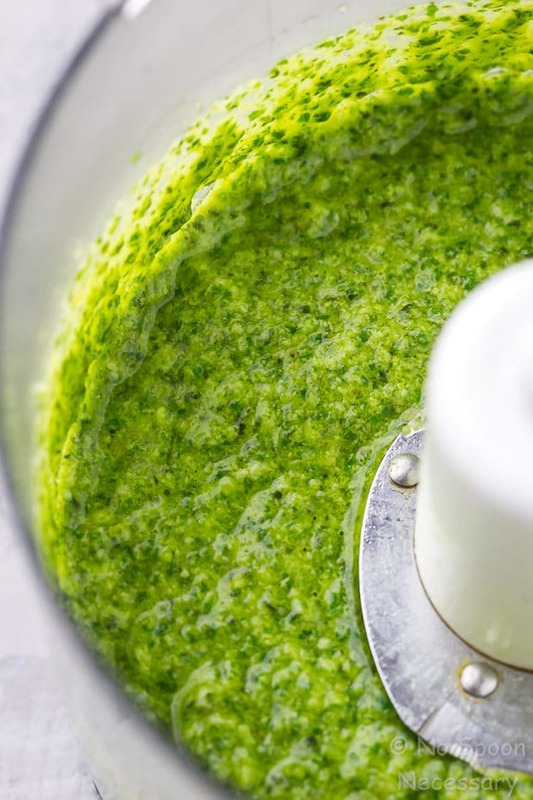 While the pasta is cooking, make the pesto by adding all the ingredients, minus the oil, to a food processor. Pulse until everything is finely chopped, and then stream in the oil while the machine is running. Taste the pesto and adjust it to taste with salt and pepper. When the couscous is done cooking, transfer it to a colander and rinse it with cold water. Add the asparagus to the colander so both can drain. 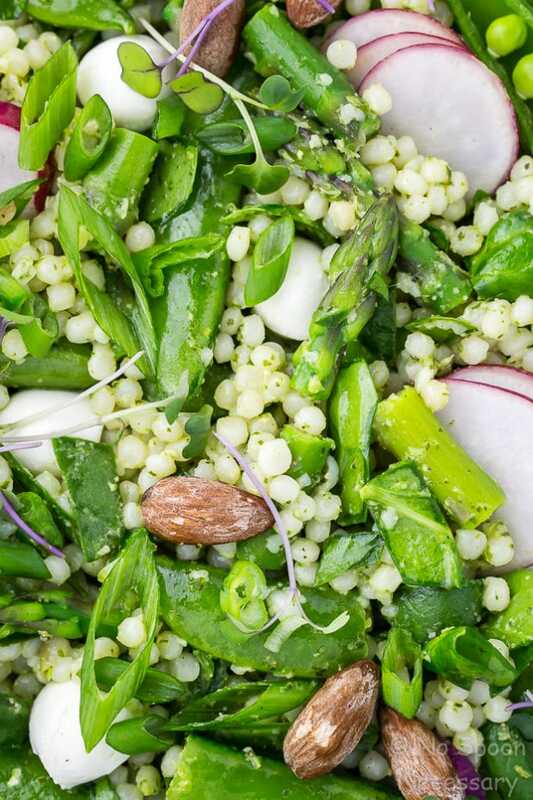 To serve, transfer the drained couscous and asparagus to a large bowl and add in the pesto. Toss well to combine. Then, add in the remaining vegetables, almonds and mozzarella. Toss everything again. When cutting your asparagus into bite sized pieces, make sure you keep the stalks and tips separate. The stalks will take longer to cook and become tender-crisp than the tips, so make sure you add them to the pot first. All the measurements for the vegetables in the recipe are merely a suggestion. Feel free to add more of what you love, and less of what you don’t! I encourage you to customize this to your liking. Toasting the pine nuts for the pesto is optional, but highly recommended if you want pesto with ALL the flavor! It’s really easy to toast them, and I included instructions in the notes section of the recipe below. If you want VIBRANT green pesto, blanch your basil leaves. Simply add them to boiling water and cook for 10 seconds. Use a slotted spoon, or skimmer, to immediately remove them and transfer them to an ice water bath. Drain the leaves and squeeze out the excess water before using. *I blanched my basil leaves for this recipe. If you want a thinner pesto, slowly stream in more olive oil, one tablespoon at a time, until your desired consistency is achieved. The pesto can be made 2 days in advance, and stored, covered in the refrigerator. If you are going to make it in advance, I highly suggest blanching the basil (see note 5) for the pesto, or your pesto will be a dingy green. 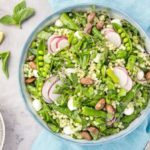 If you like a lot of sauce with your couscous pasta salad, or just really love pesto, I suggest you double the pesto recipe below! 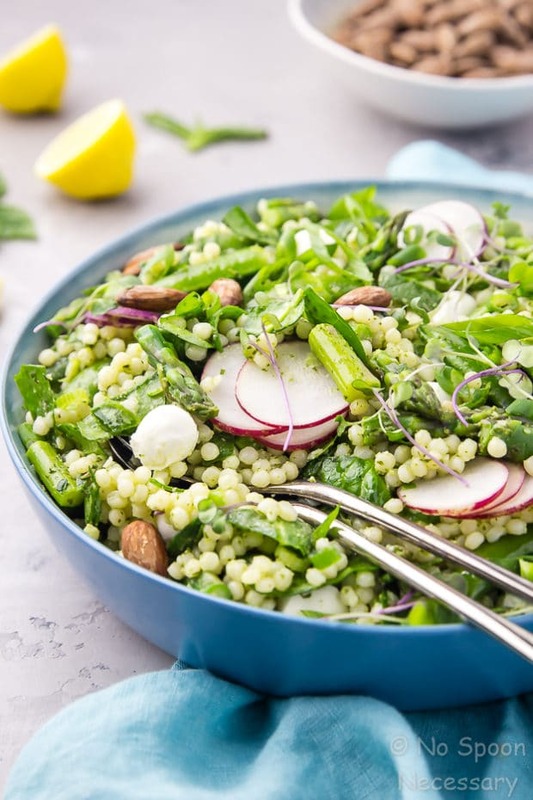 This Spring Couscous Salad with Lemon-Basil Pesto needs to be in your life. As a side at your next BBQ, for your lunch tomorrow, as your dinner all week on repeat. WHATEVER. Just get this in your pie hole. Because I KNOW you want to glow. Until next week friends, cheers – to scrumptious salads. Blanch the Asparagus: Fill a medium bowl with water and ice. Set aside. Bring 4 cups of salted water to a boil*. Add the stalks of asparagus to the pot and boil for 2 ½ minutes. Add in the asparagus tips and continue to boil for an additional minute*, or until the asparagus is tender-crisp. Use a large slotted spoon to transfer the asparagus to the ice water bath to stop the asparagus from cooking further. Let sit 2, or more minutes, and then drain. Add the couscous to the boiling water. Cover, reduce heat and simmer for 8-10 minutes, or until al dente. Drain and rinse the couscous under cold water. 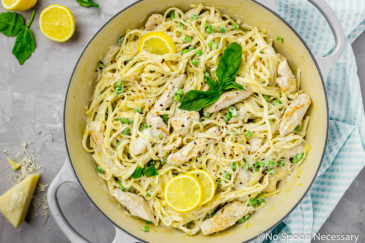 Meanwhile, Make the Lemon-Basil Pesto: In the bowl of a food processor, combine the basil, garlic, pine nuts, parmesan, lemon juice, zest, ¼ teaspoon salt and a pinch of pepper. Pulse until everything is finely chopped. With machine running, slowly drizzle in olive oil and process until smooth. * Taste and adjust for seasoning with salt and pepper. Set aside. 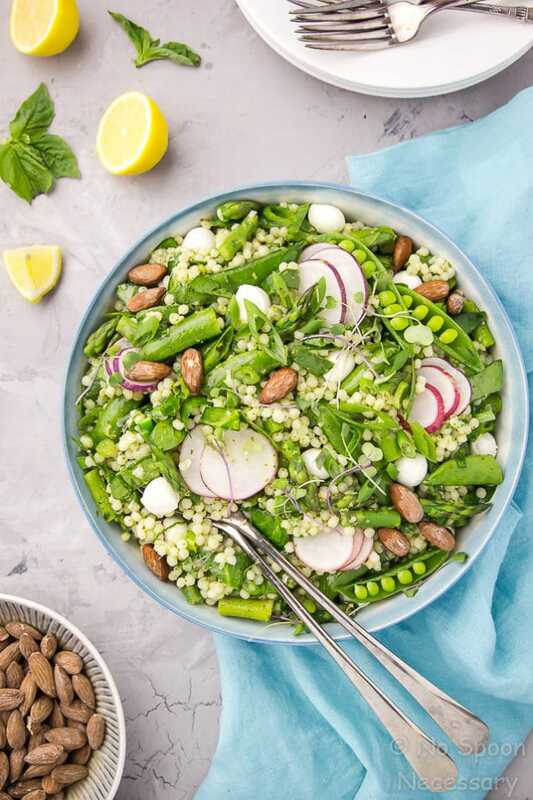 To serve: In a large bowl toss the drained couscous and asparagus with the pesto. Add in the snap peas, spinach, and scallions. Toss again. Top with radishes, mozzarella and sprinkle with almonds and optional garnishes. Enjoy! 1. When cutting your asparagus into bite sized pieces, make sure you keep the stalks and tips separate. The stalks will take longer to cook and become tender-crisp than the tips, so make sure you add them to the pot first. 3. All the measurements for the vegetables in the recipe are merely a suggestion. Feel free to add more of what you love, and less of what you don’t! I encourage you to customize this to your liking. 4. Toasting the pine nuts for the pesto is optional, but highly recommended if you want pesto with ALL the flavor! It’s really easy to toast them. Preheat the oven to 350 degrees F. and line a baking sheet with aluminum foil for easy clean up. Place the pine nuts on the prepared baking sheet and bake for 5-6 minutes, or until golden brown. Let cool completely before using. 5. If you want VIBRANT green pesto, blanch your basil leaves. Simply add them to boiling water and cook for 10 seconds. Use a slotted spoon, or skimmer, to immediately remove them and transfer them to an ice water bath. Drain the leaves and squeeze out the excess water before using. *I blanched my basil leaves for this recipe. 6. If you want a thinner pesto, slowly stream in more olive oil, one tablespoon at a time, until your desired consistency is achieved. The pesto can be made 2 days in advance, and stored, covered in the refrigerator. If you are going to make it in advance, I highly suggest blanching the basil (see note 5) for the pesto, or your pesto will be a dingy green. 7. If you like a lot of sauce with your pasta salad, or just really love pesto, I suggest you double the ingredients for pesto to make a bigger batch! 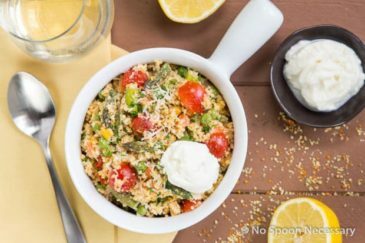 This sounds like the perfect combination of flavors, love the couscous salad. You are not kidding – time is flying by – and there never seems to be enough time in the day…GAHHHHH!!!! You were right Cheyanne; I love love love this recipe. Perfect for this weeks nutrition challenge and my everyday life!!! LOL, all this green food is making me giddy. I defiantly don’t eat enough couscous, and the addition of these salty almonds brings me pure joy. This week did fly and the weekend went even faster. 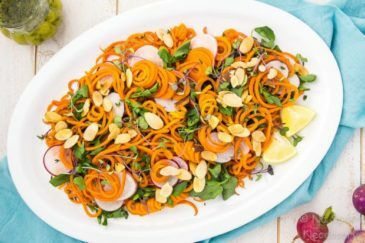 This recipe si so healthy, Cheyanne! Thanks a bunch for providing amazing recipes! 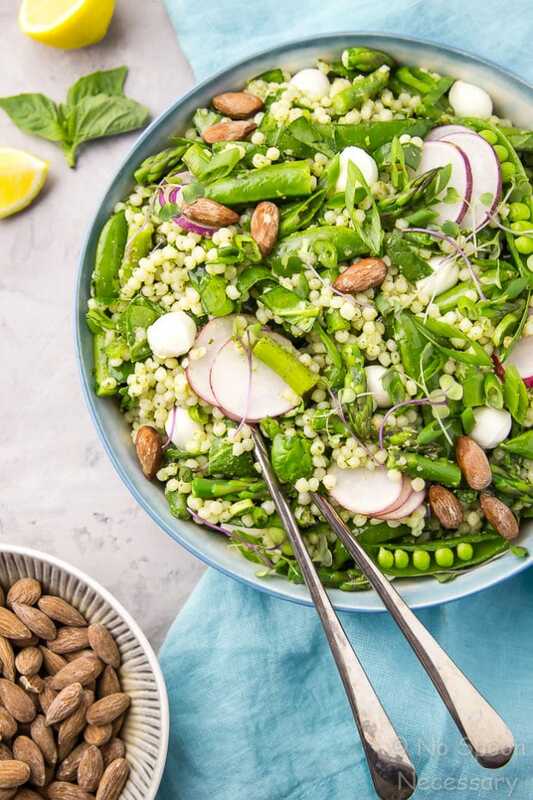 Oh wow Chey. . .this salad looks so refreshing and springy and if it is going to make me glow. . .well. . .count me in. And from the pesto to the scallions to the asparagus. . .I just love all the ingredients (even if my pee will stink. Ooops!). As for the cheese, definitely count me in especially if said cheese is fresh mozzarella. I love salads like this, Cheyanne! There’s so much good produce at the market right now – love how you’ve got some many delicious flavors in here. 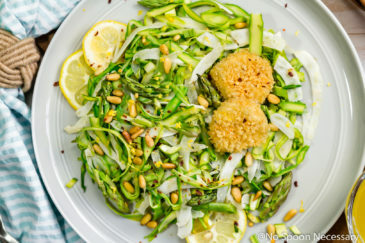 Love the pesto, asparagus, crunchy almonds and creamy mozzarella – I’d eat the whole thing! Hope you’re having a good weekend! My husband asked for a giant salad for dinner tonight (crazy, right?) and this is just the ticket!! So looking forward to trying it out. Such fresh, springy flavors!! Have a great weekend! Glowing green? Wow! So much in love with the name of this lush green said, it’s delish flavors and colors, and texture. Pesto and mozzarella sound like a great addition to this salad. And that dressing is too scrumptious. Loving it, Chey. Cheers. Have a nice weekend my friend.